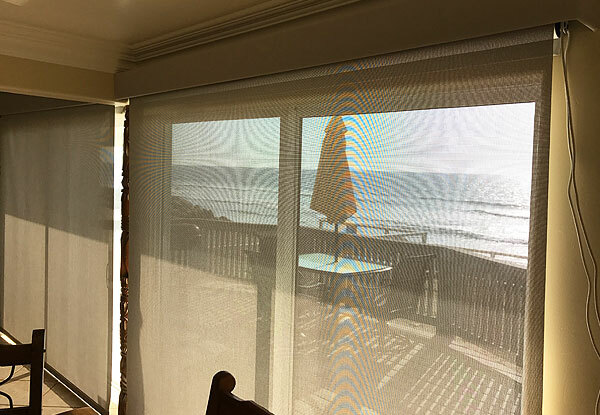 Drapery Land installed this motorized roller shade in Oceanside to filter natural light and reduce the heat for guests sitting outdoors. We offer fast turnaround times personalized onsite estimates, and professional window covering installation for all of San Diego County. 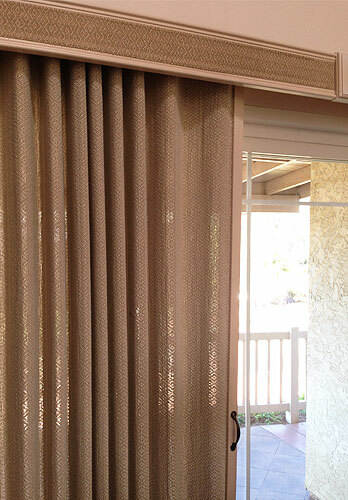 This Kingston swag valance with contrasting side panels in Poway was installed to cover the hardware of the existing blinds and create a finished, decorative look. 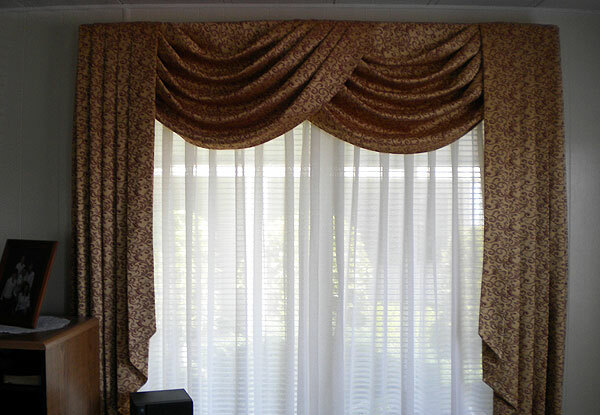 The patterned valance fabric was chosen to complement the room’s interior design. We installed this pleated valance in Valley Center, California to beautifully cover the top of our client's window blinds. 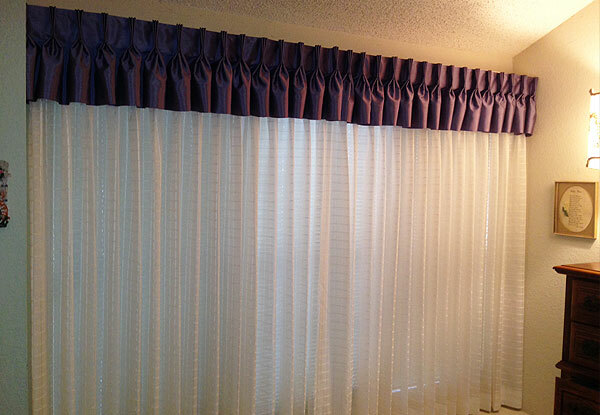 Our valance installations are customized to fit the size of the window as well as your home's interior design. Our experienced team installed these window drapes in San Diego with a contrasting valance for a pop of color. 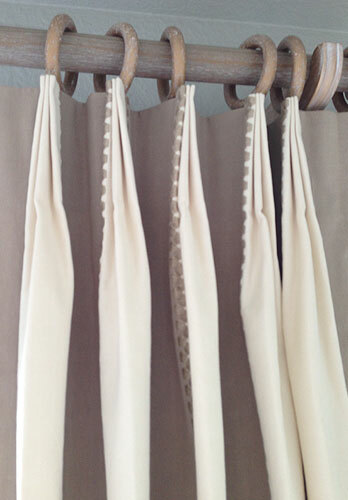 Draperies provide extra protection from light, heat, and sound, and can also add style and personality to a room. Drapery Land installed a swag curtain over a cellular shade in Carlsbad to add a touch of style and complement the home’s decor. All of our high quality window treatments can be custom designed from a wide variety of colors, accents, and fabrics. 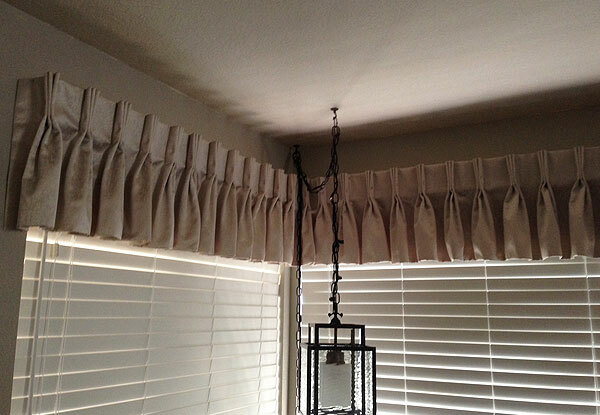 Our reliable technicians installed these swag and cascade draperies over pleated sheer curtains for a San Marcos home. All of our high quality window coverings are designed according to our clients’ needs, budgets, and aesthetic preferences. 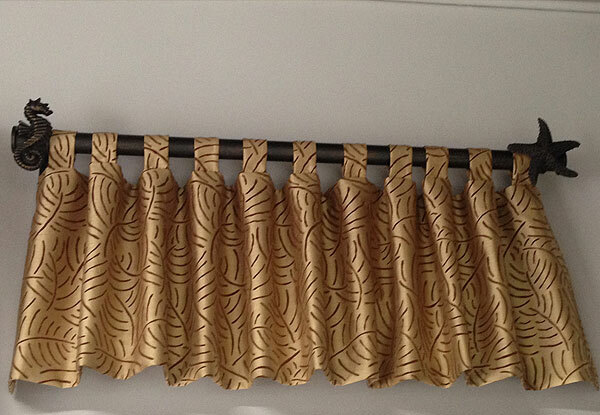 This tab valance in Carlsbad was custom fitted on a decorator pole to add a luxurious accent to our client’s home. Our technicians always use accurate measurements to deliver outstanding results each time. 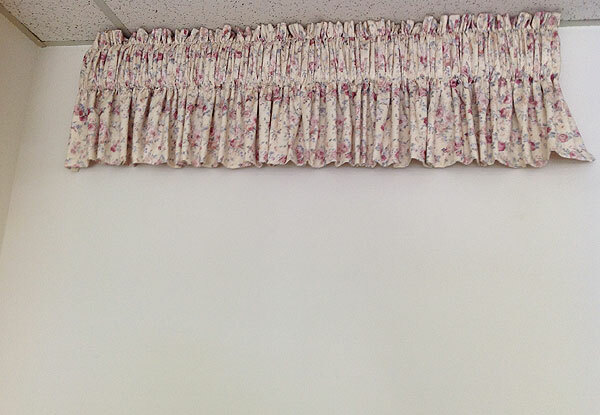 A custom valance brings color and personality to an otherwise plain wall. 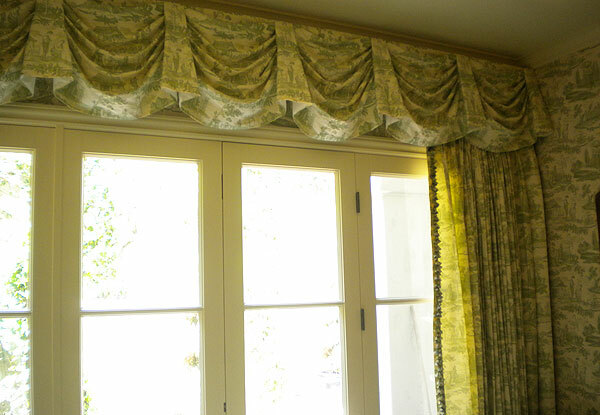 This drapery valance in Carlsbad was personalized with custom fabric and a 4" drapery rod that matches our client’s style. 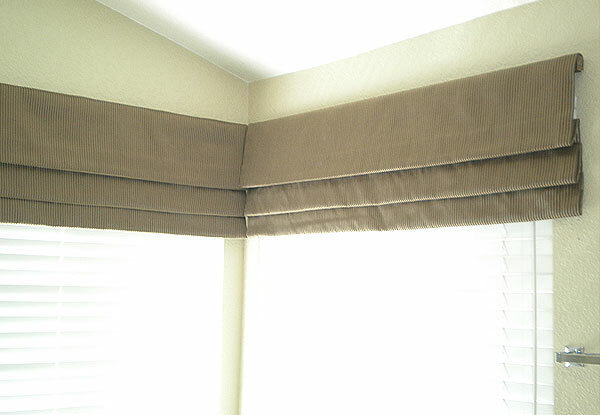 Drapery Land’s team of window covering experts installed this offset mock Roman valance for a Rancho Penasquitos home. We offer quick turnaround times on custom valances to all of San Diego County, including Vista, Carlsbad, Poway, and nearby areas. We installed this custom roller shade for an Escondido client. They wanted a cassette valance to conceal the hardware and add a finishing touch to the window. 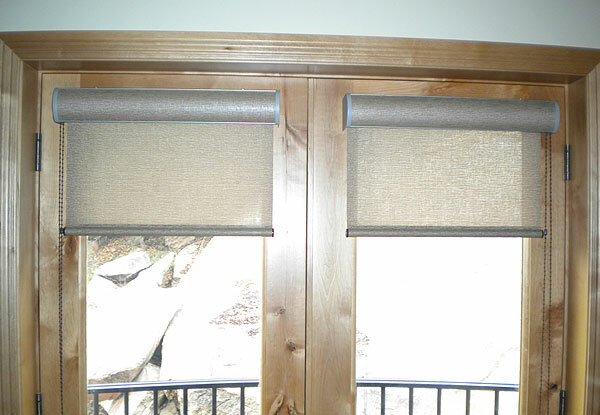 We offer a wide range of custom shade options, including solar shades, blackout shades, bamboo shades, and more. Blackout shades can reduce energy costs by blocking light, heat, and glare. 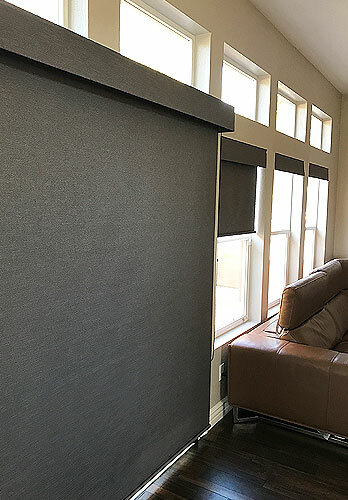 This blackout roller shade in San Marcos was installed with a custom valance to provide a high level of privacy and energy efficiency. 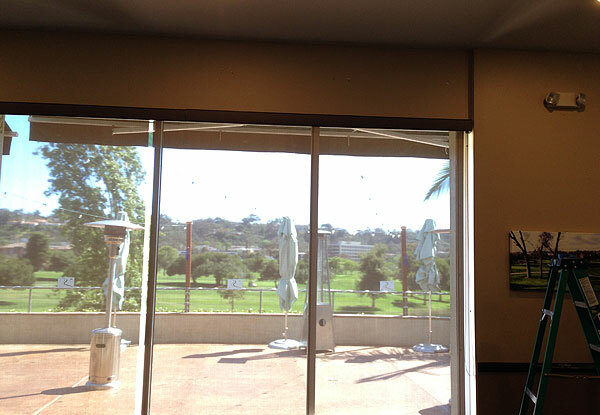 This cellular shade in La Costa was designed to provide partial privacy without impeding the view. While this shade is a top down/bottom up style, we can also install shades to pull from either the left or right side for added convenience. 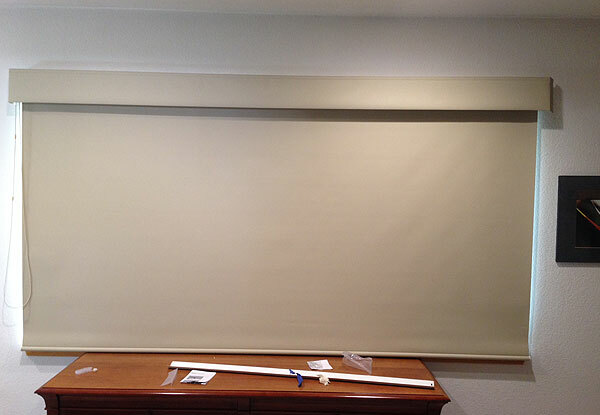 We installed these easy-to-use custom roller shades in Escondido. Roller shades can be conveniently retracted into the cassette valance at the top of the window, making them a great option for swinging doors. These woven wood shades in Escondido add natural texture to the interior decor of the room. We offer a wide range of shades styles, including bamboo shades, cellular shades, roman shades, solar shades, and more. 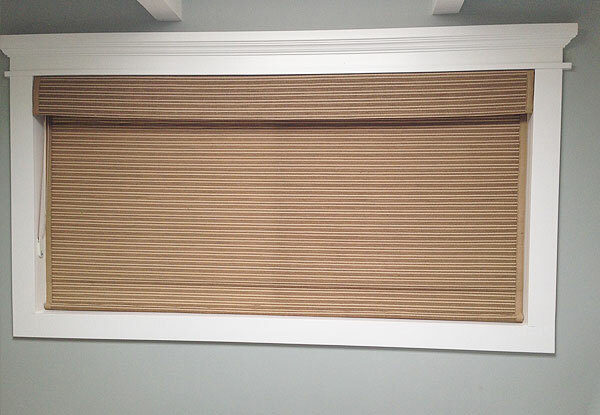 These custom window shades in Encinitas add a stylish, natural look to the windows even when they are raised up. They are made out of a woven wood fabric that is durable, versatile, and can be designed to fit a wide variety of windows and doors. 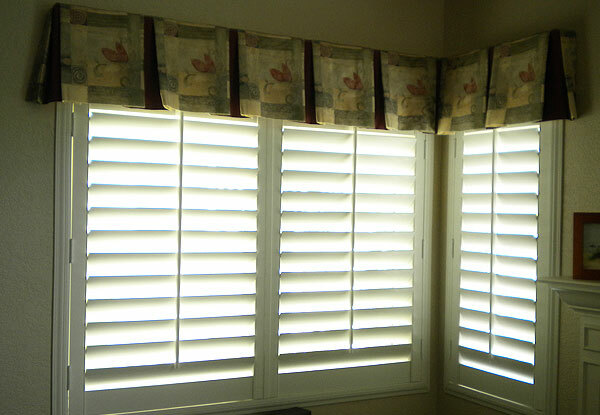 We installed these vinyl plantation shutters in Oceanside and completed the look with a custom fabric valance. At Drapery Land, we have over 20 years of experience in creating highly customized window treatments to fit a wide range of design preferences and budgets. We installed these corner drapery panels for an El Cajon residence. 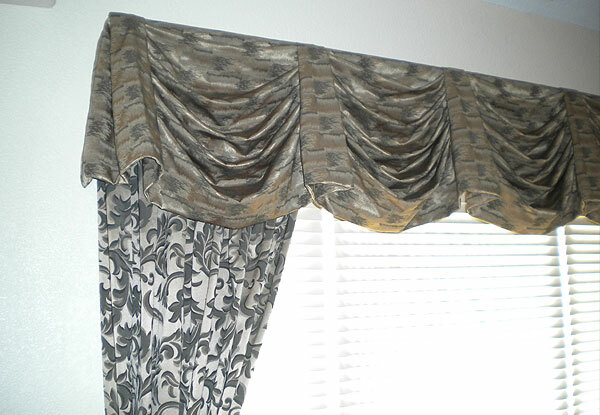 The mock Roman valance underneath adds a clean and luxurious look to the entire window. We installed this roller shade in Mission Valley for a commercial client. Roller shades are easy to open and close, making them great options for restaurants, offices, reception areas, patios, and more. 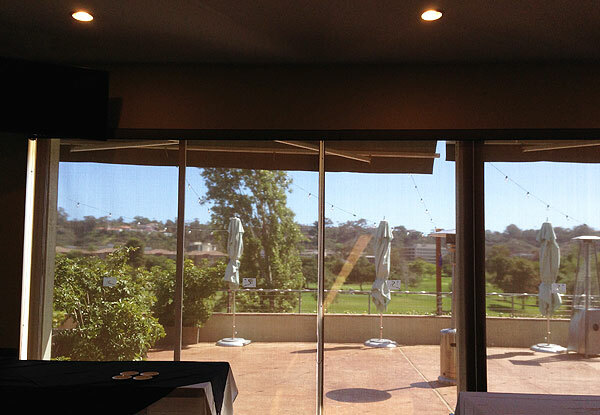 This roller shade in Mission Valley effectively shields against harsh sunlight without impeding the view. We’re happy to help our commercial clients find the right shade option for their needs, and offer free on-site consultations and estimates. 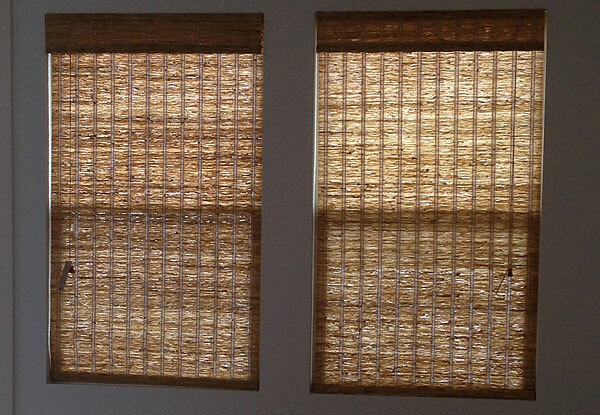 Drapery Land installed these woven wood window shades in Encinitas. We have over 30 years of experience designing and installing custom shades and window blinds in Carlsbad, Vista, San Marcos, Escondido, and surround areas. This window treatment installation in Santa Monica features natural woven wood shades. During a personalized onsite consultation, one of our licensed window installers will bring a diverse selection of samples and design books to help you pick the fabric, color, and style of your window covering. Our experienced team installed a cellular shade and a vertical shade in Encinitas that perfectly suits our client's desired function and style. 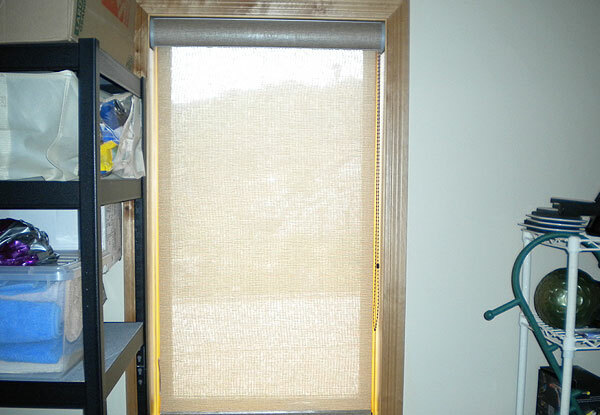 All of our shades and blinds are fully customizable, and can be installed to pull from either the left or right for ease of use. We installed this Kingston valance and matching drapery in Rancho Santa Fe to create an attractive frame for the window and match the color scheme of the room. We offer a broad range of drapery styles, such as renaissance, traditional, and contemporary, that can be special ordered with custom colors and finishes. 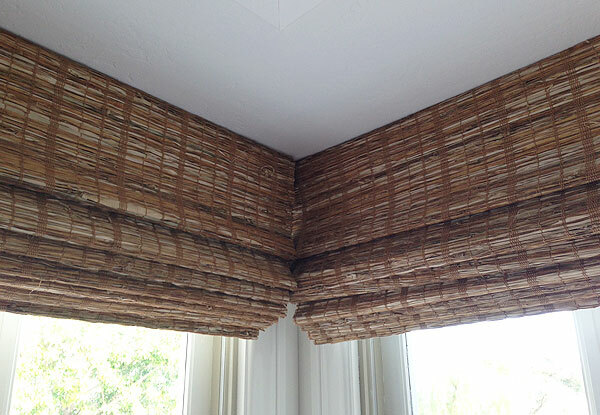 This Mandalay woven wood folding shade in Escondido adds privacy and allows our client to control the level of light in the room. 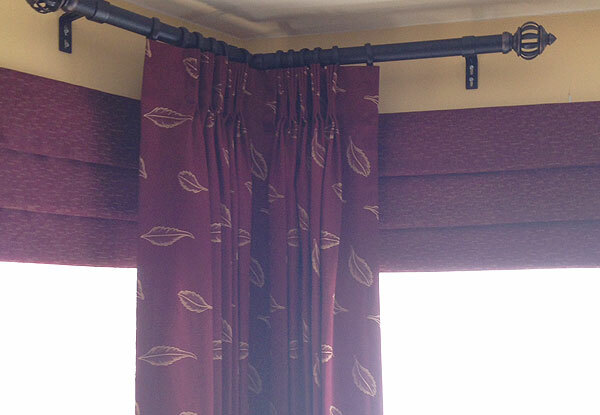 Our team also installed a valance to conceal the hardware and create a finished look. Drapery Land customized and installed this woven wood panel track for a Vista home. The panels feature a stacked design that provides easy access to the door while increasing privacy and blocking out light. 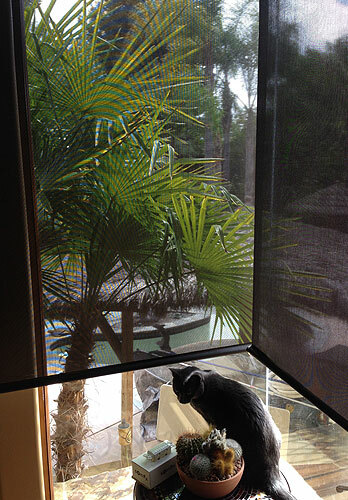 We installed a Mandalay woven wood shade in Escondido to provide full coverage for this sliding glass door. 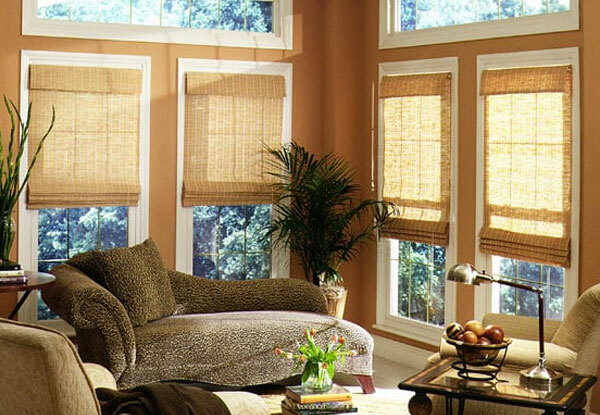 We carry a broad selection of trusted name brand shades, including Skandia, Century Shade and Blind, Graber, and more. Our technicians customized these blackout shades in Oceanside to completely cover the main window while leaving the upper windows open to let in natural light. The roller feature makes it easy to precisely adjust the lighting. 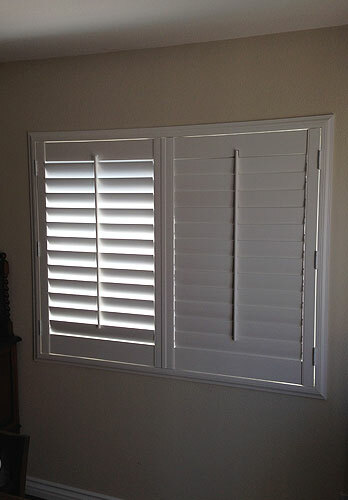 Drapery Land offers wood and vinyl shutters in a variety of colors, frame styles, stains, and finishes. 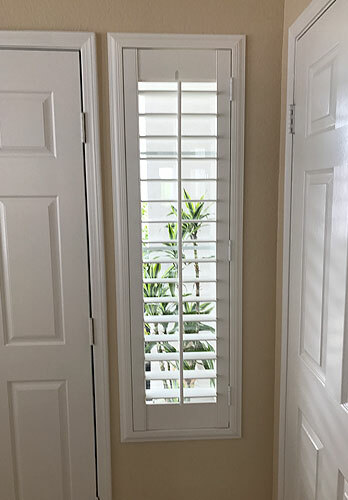 Our experienced team installed these white vinyl shutters in San Diego after carefully measured the window opening to ensure a perfect fit. Our team installed vinyl shutters in Oceanside to perfectly fit this unique, narrow window. All of our American-made plantation shutters are locally crafted from high quality materials that are long-lasting, aesthetically pleasing, and durable. 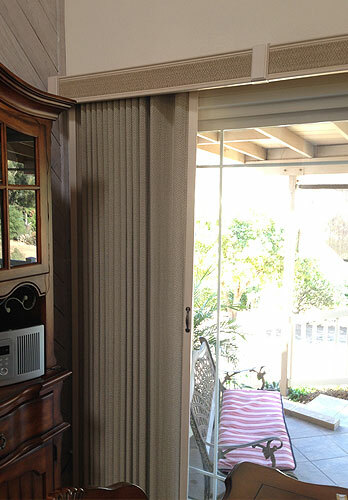 We offer an extensive selection of custom window treatments for San Diego County homes and businesses. Some popular options include grommet draperies, insulated drapes, cord pull or wand pull drapes, motorized draperies, and more. 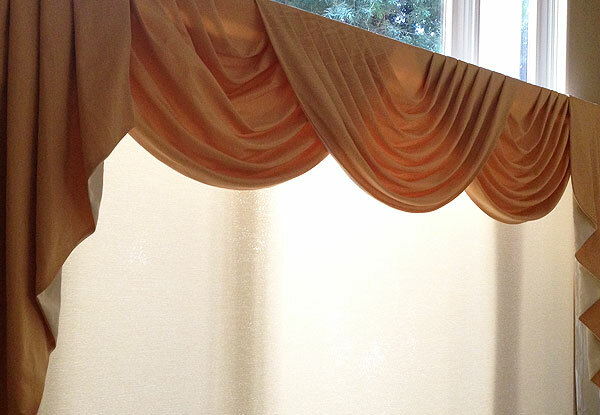 We installed this pleated drapery and sheer curtains in Fallbrook on our client’s preferred decorator rod. 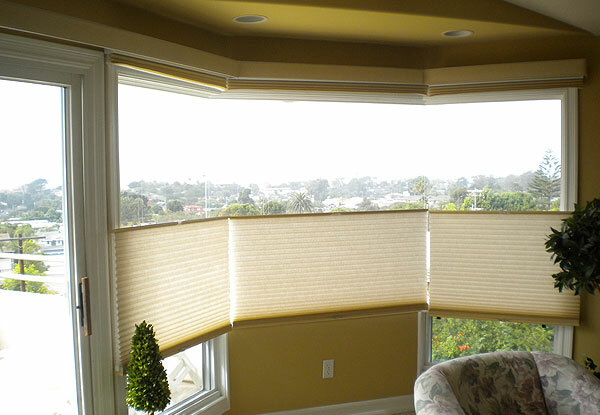 Drapery Land installed this motorized roller shade in San Diego to create a light screen over the home’s glass windows. 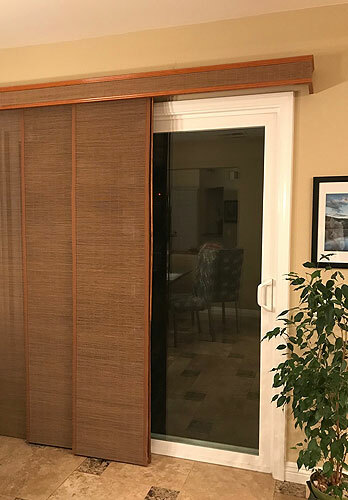 We offer a wide range of custom shades and blinds for San Diego County, including bamboo shades, honeycomb shades, cordless blinds, panel track shades, mini-blinds, and more. 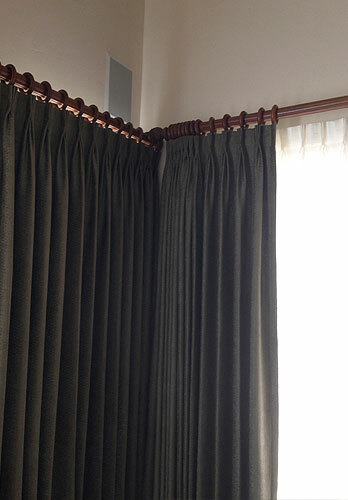 These European pleated drapes in San Diego were hung on a stylish decorator rod and curtain rings. During an on-site consultation, we bring a broad selection of style books and fabric swatches to make sure you find the perfect window coverings and drapery hardware for your needs.